It was only earlier this year that work began on 1915 6th Street (right). The property stood as a vacant lot for years, but was snapped up by a condo developer. After being on the market for just a few days at $299,000, the 1-bedroom, 1.5-bathroom basement condo at 1915 6th Street is now under contract. LeDroit Park has seen a good deal of reinvestment over the past few years despite the economy. A new condo is nearing completion at 5th St and Oakdale Place (bottom left) after sitting as vacant lot for years. 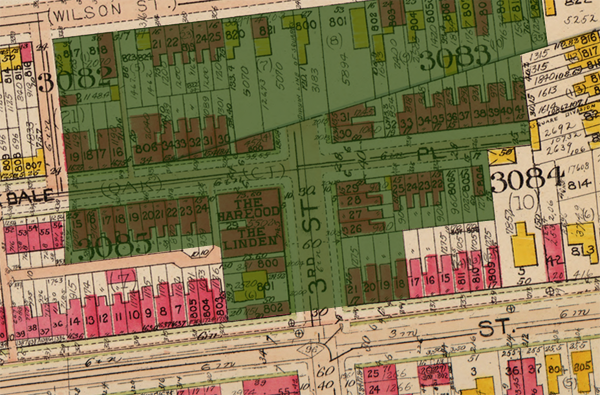 1907 3rd Street (bottom right), after sitting as a vacant apartment building for many years, is now a condo building. 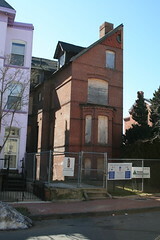 NPR reporter Ari Shapiro and his husband are renovating the old McGill house at 1922 3rd Street (below). The Park at LeDroit was built on the site of the Gage-Eckington School. The school, built in the 1970s, was itself built over streets, houses and apartment buildings. At the time, 3rd Street extended north of Elm Street and dead-ended just before reaching V Street. 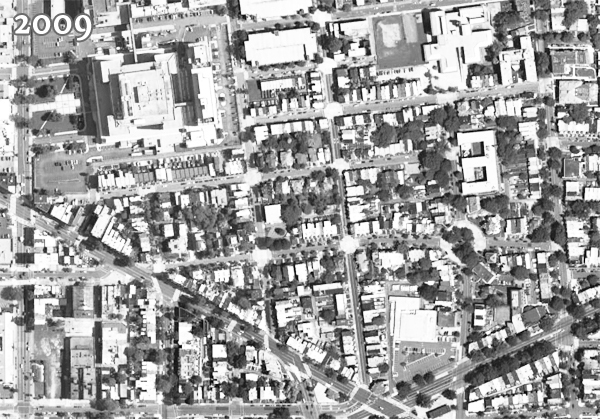 Oakdale Place extended eastward from its current terminus at the park to dead-end at what is now the eastern boundary of the park. 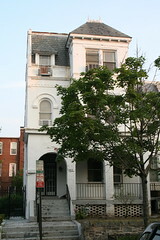 Two apartment buildings on the site, the Linden and the Harewood were named after local streets. 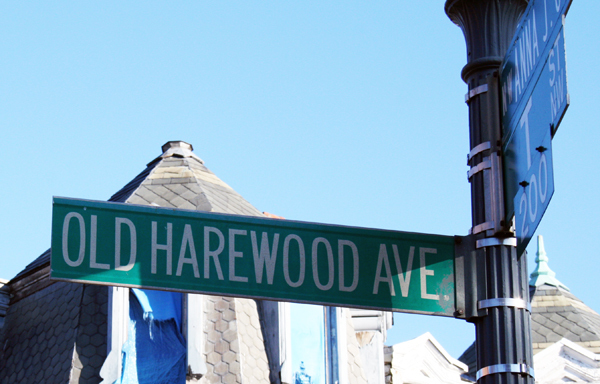 Before the city changed the neighborhood’s street names, 3rd Street was Harewood Avenue and 4th Street was Linden Street. We found this 1901 description of the apartments. 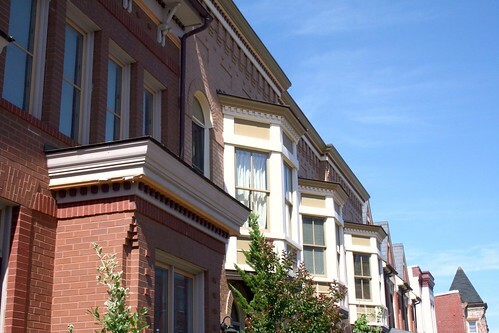 What’s most notable is that the apartments are marketed to black Washingtonians and thus reflects the neighborhood’s turn-of-the-century transition from a white neighborhood to a black neighborhood. Le Droit Park—Corner of Harewood and Oak Streets. Mr. Banes the the real estate dealer has erected two of the most modern flats in Washington situated in Le Droit Park. The situation of these flats is an ideal one, on Third street, two doors from the Fourt street car line. The finish of the flats is elegant, and they have a preposessing appearance. They are three stories high, and each floor has three flats of four rooms each and bath. The whole flat is heated by steam, thus saving the necessary expense of buying fuel. Each flat has a parlor, dinning [sic] room, bed room, kitchen, and bath room and private hall rooms, and halls are heated by steam. The kitchens have a modern gas range, hot and cold water, cupboards, pantry attachment. These flats are no doubt, the best in the city. Persons having a large family can easily rent two adjoining flats saving the enormous rent of an entire house. They are thoroughly and artistically finished. The walls are papered and frescoed, and glasses of a large size, supported by a modern mantel piece are in each parlor. Le Droit Park has become a pleasant part of Washington in which to reside and these beautiful flats are a happy addition to the residences there. Mr. Banes has spared no pains in making these flats comfortable and inviting and already applications are being made for retals thereof. 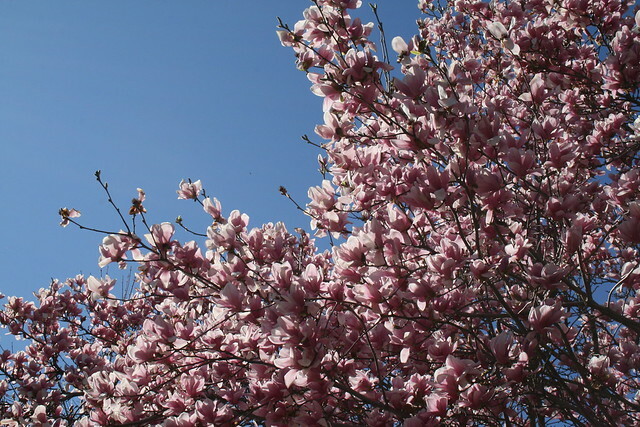 Colored people with first class reference who desire a beautiful part of the city in which to live, and at the same time occupy comfortable and improved apartments without renting a whole house, and paying high rent, can find a happy medium in these flats. The terms are easy. The buildings are open daily for inspection. For further information call at the office of Mr. Charles E. Banes, corner of 14th and G sts. 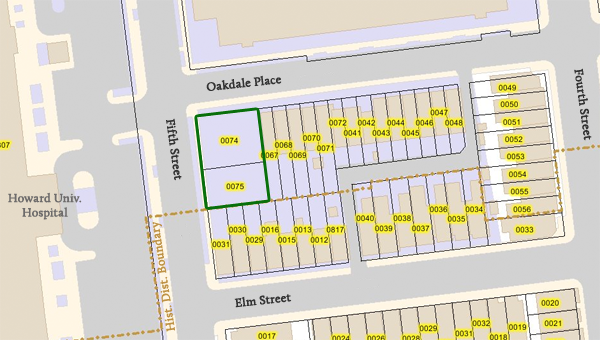 n. w.
Last summer reports surfaced of a gambling house on Fourth Fourth Street between Elm Street an Oakdale Place. After a months-long investigation, the MPD finally swooped in and arrested two residents of the house in late January. 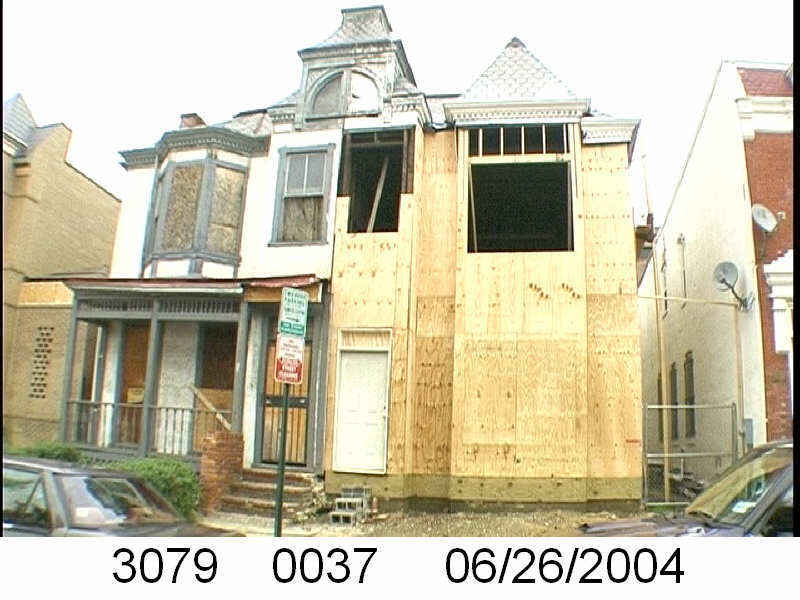 After the arrest the MPD informed the neighborhood that they also found sound-proofing material attached the interior walls to reduce the noise emanating from the house. Whether this was out of respect for the neighbors or fear of getting caught, one cannot know. Last month the police and U.S. Attorney obtained a conviction and Lt. Alberto Jova informs us that an eviction is also pending. What’s That on the Grassy Knoll? 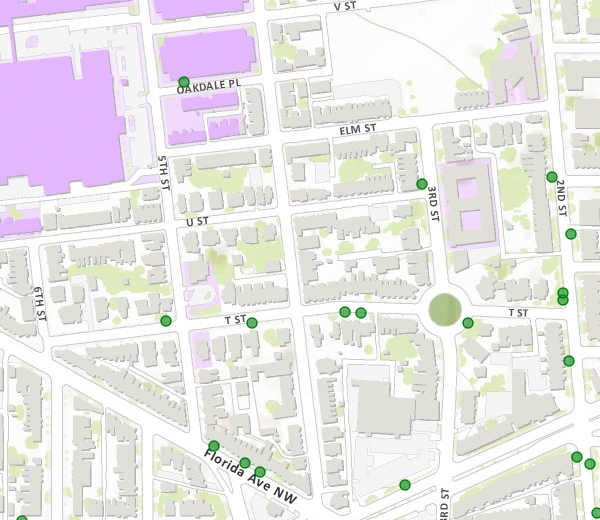 At the corner of Fifth Street and Oakdale Place, at the very edge of the Howard University campus, sits a fenced-in grassy knoll. The site is across the street from the hospital and sits just outside the historic district boundary. About a year ago a sign planted on the site announced the pending arrival of new houses. The sign came down many months ago and nothing much happened. Sure, Howard mowed the lawn, but not much else happened. BUILDING A NEW 3-FLOOR WITH A CELLAR 2-UNIT FLAT STRUCTURE. The lots are much larger than every other lot on the block and these two two-unit houses will likely be spacious. Unlike Metro, Howard University Hospital must stay open no matter the weather. As such the groundskeepers are quick to remove snow the moment the first flake hits the ground. 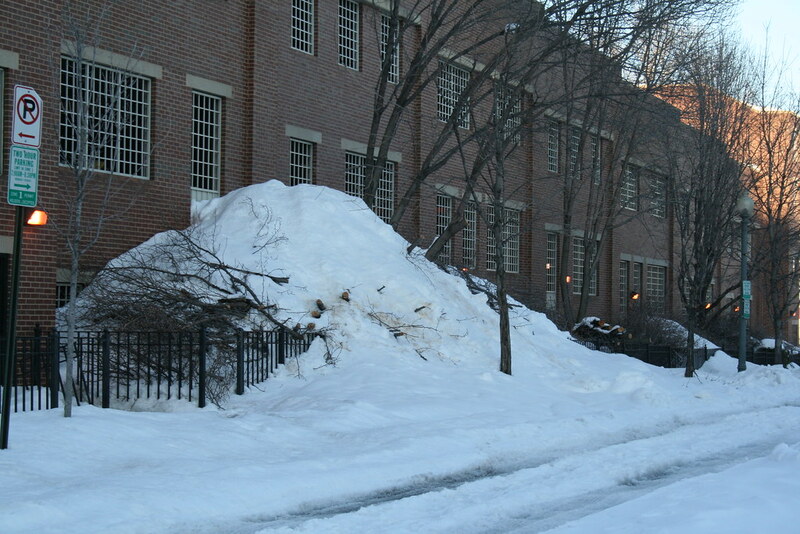 The employee parking garage on the block bounded by Fourth Street, V Street, Fifth Street, and Oakdale Place also needs its top level cleared of snow. But where does the snow from the top level go? Well, over the edge it seems.